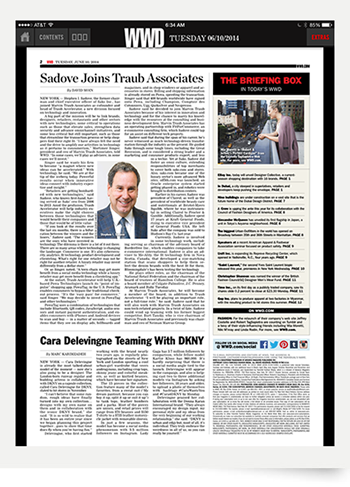 NEW YORK — Stephen I. Sadove, the former chairman and chief executive officer of Saks Inc., has joined Marvin Traub Associates as cofounder and head of Traub Accelerator, a new division focused on technology and innovation. “Retailers are getting bombarded with new technologies,” said Sadove, who knows first-hand, having served as Saks’ ceo from 2006 to 2013. Amid the profusion, Traub Accelerator will help industry executives make the right choices between those technologies that would benefit their companies and those that would be of little value. Sadove said he decided to join Marvin Traub Associates because of his interest in innovation and technology and for the chance to marry his knowledge with the resources at the consulting and business development firm. Marvin Traub Associates has an operating partnership with FitForCommerce, an e-commerce consulting firm, which Sadove could tap for an assist on different tech projects. Sadove said that during the span of his career, he’s never witnessed as much technology-driven transformation through the industry as the present. He guided Saks through some tough times, including the Great Recession, and is considered a strong leader and a marketing and consumer products expert, and less so a techie. Yet at Saks, Sadove did foster an omni culture, extending responsibilities of top merchants to cover both saks.com and stores. Also, saks.com became one of the luxury sector’s more advanced Web sites; off5th.com was launched; an Oracle enterprise system started getting phased in, and robotics were brought to distribution centers. Earlier in his career, Sadove was president of Clairol, as well as the president of worldwide beauty care and nutritionals at Bristol-Myers Squibb, where he was instrumental in selling Clairol to Procter & Gamble. Additionally, Sadove spent 17 years at Kraft General Foods, rising to executive vice president of General Foods USA. He left Saks after the company was sold to Hudson’s Bay Co. last year. Currently, Sadove is involved in some technology work, including serving as chairman of the advisory board of Borderfree Inc., which enables companies to take e-commerce international. Sadove is also an adviser to Me-Ality, the fit technology firm in Nova Scotia, Canada, that developed a size-matching station that scans shoppers to help them select the denim brands with the best fit for them. Bloomingdale’s has been testing the technology. He plays other roles, as the chairman of the National Retail Federation and the chairman of the board of trustees of Hamilton College. He is also a board member of Colgate-Palmolive, J.C. Penney, Aramark and Ruby Tuesday. At Marvin Traub Associates, he will become a member of the board, in addition to Traub Accelerator. “I will be playing an important role, not a full-time role,” he said. Sadove said that he will also work with Marvin Traub Associates on non-tech-related projects. In a twist of fate, Sadove could wind up teaming with his former biggest competitor, Burt Tansky, who is vice chairman of Marvin Traub Associates and previously was chairman and ceo of Neiman Marcus Group.